My family recently visited our good friends in Madrid over the Thanksgiving holiday. Matthew and Catherine Meacham have always had great taste in design. Their new home, designed by Barcelona architect Tonet Sunyer, is no exception. The house is clean-lined and filled with light. Thoughtful, intelligent design is the theme. Here's a view of the patio and pool. I'm enamored with the brushed bronze cabinet doors which look like a wall, but store everything one needs to host a fabulous party - out of sight. Everything is built-in, as you would expect in a modern kitchen. What grabs you, though, is the unusual pantry. It's a walk-in galley behind the stove and sink wall. Food styling takes on a whole new meaning when the guts of your pantry are visible 24/7. Most of us would cringe at having to keep our foodstuffs neatly organized and visually appealing. And the Marmite Heirarchy. Who can keep up? Small, medium, jumbo? Catherine is quick to point out a distinct advantage: from her vantage point at the kitchen table, she can sit and make her grocery lists just by scanning the pantry shelves. My husband rushed out to The Container Store as soon as we got back to Texas, and soon had our two daughters "tiering" the cans in our own pantry. It's still not pretty, but at least now one can find the Progresso soups behind the cannellini beans. That's the interior courtyard of the home. The trees are on an "island" surrounded by a shallow trough of water. Probably takes the turtle all summer to make a lap. Anyone who knows me well knows my second-favorite place to be after my mosaic studio is the kitchen. Sometimes I have trouble distinguishing between the two. Clients request mosaics shaped like food; evil friends challenge me to make absurd constructions out of food, often requiring me to cut said food into tiny, mosaic-like pieces. A case in point: recently my friend Laura, aka "Shot Girl" (to be explained later), challenged me to create a 14-layer cake for my daughter Claire's 14th birthday. I read the blog she attached to the challenge. Easy enough. After placing the 7th layer, I started giggling uncontrollably. By myself. 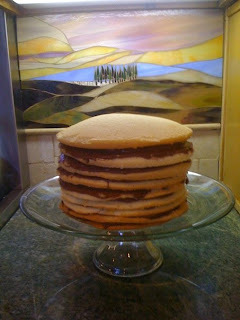 For three hours, which is how long it took to bake 14 individual cake layers using only three round pans. Eventually I decided I could have made large pancakes on my griddle and frosted them with chocolate. See what I mean about pancakes? 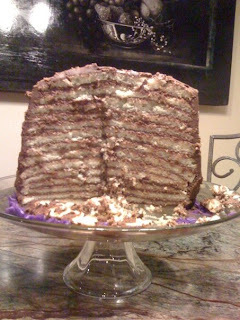 This is after nine layers, and it was starting to feel precarious. But the end result was great. The best part of all was having Claire tell me, "Mom, all my friends thought the cake was AWEsome!" 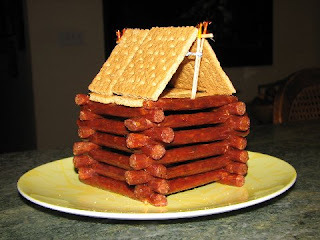 The Slim Jim log cabin. Smelly. Greasy. Totally unappetizing once you've notched each log on both ends and watched in horror as orange grease oozed out of this food product all over your hands. An "A" for effort. By now you might be suspecting that Shot Girl and I share an obsessive-compulsive trait. In case you still doubt, a few prime examples follow. 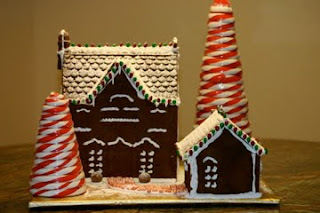 I annually drag out the Victorian gingerbread cottage mold. One year I compulsively attached candy-coated sunflower seeds (they look just like tiny Christmas lights!) to the icicles on the roofline. The candy cane trees are store bought; I won't let the kids unwrap them because I use them every year. For a Scottie-loving neighbor, Hollydogs; left over from a Texas-themed tree decorating contest, a cactus; and I always include the Man in the Moon for our atheist guests. One year I got carpal tunnel from decorating too many bitty stars and snowflakes. So last year I cut back and simplified the patterns. In addition to geese, I sometimes make roadrunners (again, the Texas tree leftovers). Whenever I see this goose I think of Miss Piggy and the Muppets singing, "Christmas is coming, the goose is getting fat..."
People love to eat 24 k gold. It's so decadent. I dusted these with gold powder purchased from Maid of Scandinavia. It's edible, expensive, and irresistible on desserts. That's a Rice Krispie bar paella. Layered with candy seafood and candy vegetables. I suspect this is retribution for the time I brought mock sushi to Shot Girl's birthday party (gummy worms and gummy fish wrapped in Rice Krispies and rolled with green leather that looks remarkably like nori). Mosaics as food; now food mosaics: I have a great client who has several of my works in her collection. Last year, she and her daughter opened a clothing boutique in Dallas called Betty Cupcake. Who do you call when you need mosaic cupcakes? Yours truly, natch. I leave you with a party shot, to continue the theme of Paul's fun friends who enjoy being ridiculous with the ones they love most. Last year, we hosted a Superheroes and Villains party. "Come out, come out, whoever you are!" said the invitation. We asked folks to come as their alter-ego. Some didn't really get it. Others, they really got it. The essential gang: King Kong; Corkscrew Man, here to save the picnic; Rolodexia, Mistress of Referrals (me); Paparazzi Scum; Shot Girl (tonight she's your friend, tomorrow she's your enemy); The Baconator (who doesn't love bacon?) and Perception Man. Wouldn't it be great if some day all of our absurd friends came to the same party? That's it for me, Paul. I have now given up my dreams of hosting my own blog; I've given you everything I have. Happy holidays to all and a prosperous and healthy 2010.